A mattress is one of the most important purchases that you can make in your lifetime. After all, you spend over one-third of your life asleep. Doesn’t it make sense to purchase a mattress that is not only high quality but also sustainable? When you purchase a mattress, it’s a long-term investment in your health and your well-being. 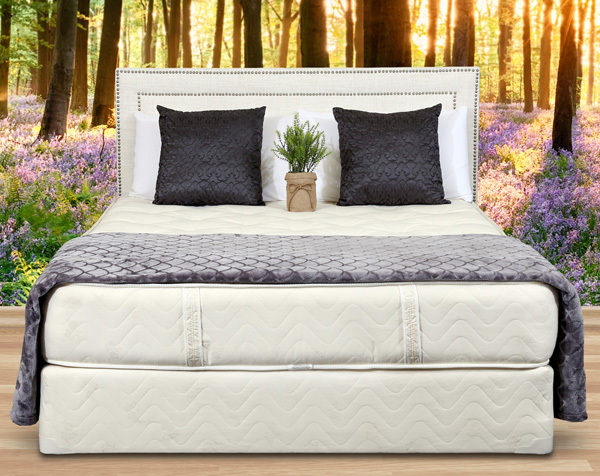 By selecting a mattress that utilizes organic material such as natural wool, cotton, and latex, you can be confident that you are making a smart choice for your comfort and for the planet. Here are four reasons why you should buy an organic mattress. Traditionally made mattresses use a wide variety of chemicals during the manufacturing process. However, organic cotton is grown without the use of harmful pesticides and fire retardant chemicals that can potentially be dangerous are not used when the mattress is made. Common fire retardants are known to be carcinogenic, and that’s certainly something you don’t want to worry about while relaxing in your bed. Additionally, organic mattresses are made from natural materials instead of synthetic fabrics and plastics that can not only be irritating but can also be harmful to your health. In many cases, allergies and problems with the respiratory tract are aggravated by the pesticides and chemicals used in traditionally made mattresses. Often, doctors will recommend an organic mattress for someone who suffers from significant allergies or who has respiratory problems such as bronchitis or emphysema, and other respiratory issues. Because organic mattresses are chemical and pesticide-free, they are inherently hypoallergenic. People who have sensitivities to chemicals are less likely to have an allergic reaction to the natural cotton and latex used in organic mattresses. Natural wool is resists mildew, mold, dust, and bacteria, making it an excellent choice for individuals who require a hypoallergenic mattress. Those who have purchased an organic mattress often report that symptoms like runny noses, sneezing, coughing, and skin irritations are either significantly reduced or eliminated within just a few weeks of sleeping on the mattress. One problem that many people have with traditionally made mattresses is that they have poor temperature regulation. Memory foam, for example, often becomes very hot at night, whereas organic latex, cotton, and wool wick moisture away from the body and help a mattress to stay cool, especially during hot summers. However, organic mattresses are also able to stay warm during the winter due to the natural insulation capabilities of the mattress components. Individuals find that organic mattresses are comfortable to sleep on during any time of the year, no matter what temperature the home is. Our carbon footprint is something that has a big impact on our planet. When you purchase a traditionally made mattress laden with chemicals, you are contributing to the overabundance of refuse in our nation’s landfills. However, organic mattresses are made sustainably and are also biodegradable. Growing methods for organic cotton use less land and natural resources than non-organic cotton, and latex can be extracted from rubber trees without requiring the tree to be cut down. Simply put, those who wish to make eco-conscious purchases can easily start with their mattress. What type of mattress you buy is largely a personal choice. However, if you desire maximum comfort, minimal chemicals, and value sustainability and biodegradability, an organic mattress is a smart investment. Learn more about Gardner’s mattresses and our commitment to quality today. Let us help you invest in your rest.